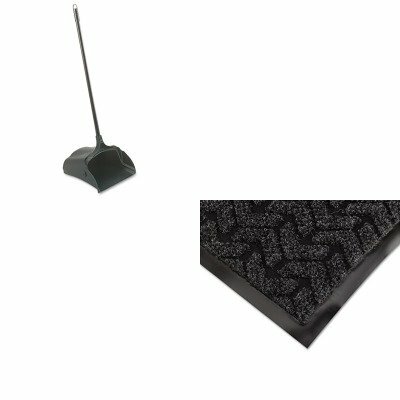 lt;stronggt;CWNTE0046AClt;/stronggt;lt;BR/gt;Anthracite Tire-Track Mat, 4' x 6'lt;BR/gt;Set the wheels in motion for a cleaner entryway. This contemporary mat with amp;quot;tire-trackamp;quot; pattern is perfect for any high-traffic area, such as schools, restaurants, malls and hotels. Heavy-duty surface is made of needlepunch polypropylene, which guarantees maximum water absorbency and durability. Lower layer holds more than a gallon of fluid per square yard. Vinyl, slip-resistant backing. Mat Type: Wiper Mat Application: Indoor Materials: Polypropylene.lt;BR/gt;lt;BR/gt;lt;stronggt;RCP253100BKlt;/stronggt;lt;BR/gt;Anthracite Tire-Track Mat, 4' x 6'lt;BR/gt;Wheeled, vinyl-coated dust pan with superior durability and ergonomic safety features. Yoke and handle assembly with larger, stronger and quieter hinge pins. Durable wheels and wear pads on back of pan extend product life. Built-in handle on back of pan lets you empty without touching pan bottom. Ideal for use in malls, restaurants and lobbies. Will not stain, discolor or absorb odors. Materials: Polypropylene with Vinyl Coated Steel Handle Width: 12 1/2amp;quot;.